who happen to be authors and so much more. Both Rich and Laura of MusicCityNashville.net are reading The Man Called Cash by Steve Turner. Since moving to Nashville we have gained a greater appreciation of Johnny Cash as a man and musician. On a pleasant Friday in January of 2016 we decided to visit the Cash property in Hendersonville, Tennessee. In Johnny’s day the area was a woodsy hideaway and a rural retreat. Over time, the community has grown into a fully developed residential neighborhood. 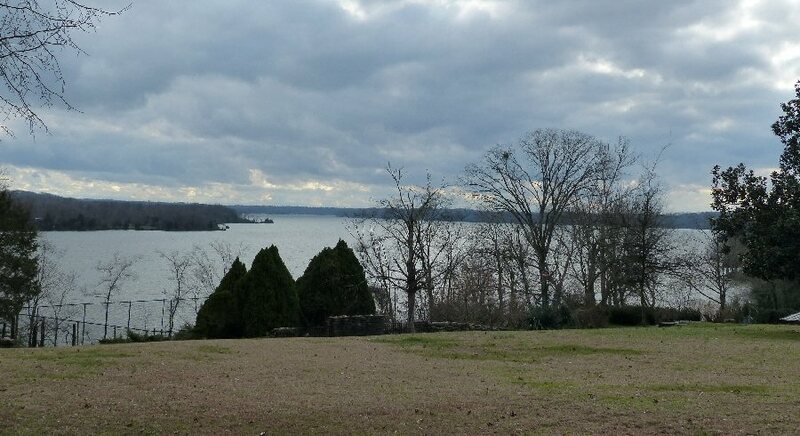 A view of Old Hickory Lake from the property Johnny Cash once owned in Hendersonville. Apparently, when the Cashes died in 2003 much of their land along with the house in Hendersonville were sold. Barry Gibb of the Bee Gees purchased the lake home. Barry’s contractors were rushing to finish construction before July 4th in 2007 and some materials caught fire destroying the legendary house thus no one is currently living there. Across the street is the ranch house also with a lake view that Johnny had given to his parents. It was the place where Johnny and June both dealing with declining health spent some of their last days as the “Mama Cash” house was easier to maneuver around. We were talking pictures of what is left of the Cash house along with the lake view when we heard a voice coming from Mama Cash’s ranch. “Hey would you like to see the ‘One Piece at a Time’ car?,” asked Brian Oxley who was standing in the driveway. “It will be here any minute.” Sure we said. In a moment a haphazard looking car pulls up still smoking a bit from the engine. This vehicle was built in honor of the comical Cash song where a GM worker steals parts and then tries to assemble a new car. The Oxleys have lovingly restored the interior of the Mama Cash home. This was just the tip of the tail fin so to speak. As we were chatting with authors Brian and Sally they invited us into the house! We were in the kitchen that Johnny Cash had hung out in. Brian and Sally for the past few years have been restoring the home to reflect the history of Cash. 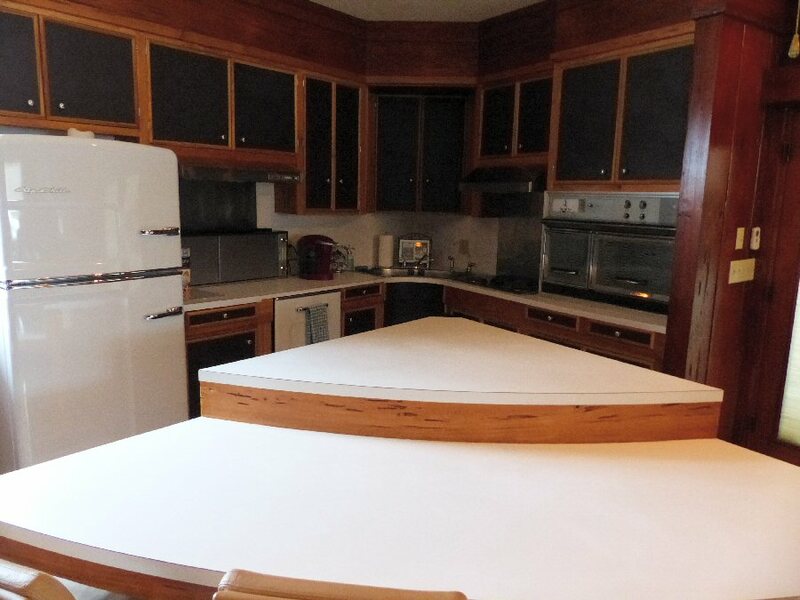 They had found a period refrigerator and had acquired some original furniture from the Cash estate. They showed us the rooms that Johnny and June slept in, too. In the course of conversation we found out that Brian and Sally – who currently own the Mama Cash house – did not know a lot about Johnny and his music when they purchased the place. They both grew up in Asia during their formative years. They heard more English music such as The Beatles than American artists. Brian and Sally became more interested when they realized that Johnny’s story is one of redemption. They found a connection between Francis Thompson’s poem “The Hound Of Heaven” and Cash’s spiritual journey. Brian and Sally have released a number of modern adaptations of Francis’s prose. 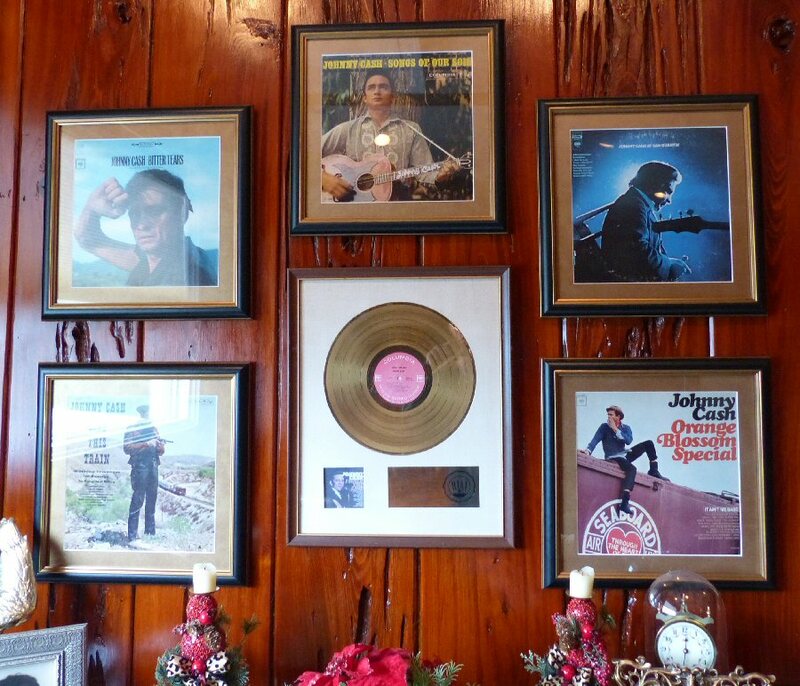 The are many photos, posters and Johnny and June related mementos hanging on the walls. Inspired, Brian and Sally spent a number of years restoring the ranch to how it would have been when the Cashes lived here. They were able to obtain information and items from Johnny’s estate. This couple is now involved with “The Farm” at Bon Aqua another well-known Cash property. It is interesting that these relatively new fans are so committed to this endeavor. Also at the ranch we were introduced to a lady who is friend of the Oxley’s. Her name is Peggy Knight. She was a personal assistant and pal to Maybelle Carter, June and Johnny for over 30 years. She has written a number of books about her experiences including My 33 Years Inside The House of Cash. Mama Cash’s house is warm and welcoming with a beautiful view of Old Hickory Lake. On the wood walls (that had to be restored as a previous owner had painted over them) in the kitchen were records along with pictures of Cash in the same room. Brian also owns the black Mercedes that Johnny drove during the last years of his life. Brian and Sally told us that Roy Orbison lived next to the Cashes. Sadly Roy’s Hendersonville home caught fire in 1968 and two of Orbison’s three sons died that day. Roy sold the land to Johnny who promised Roy that he would not build on it. Instead, Johnny planted trees as a permanent memorial to the fallen boys. Brian pointed out the spot to us. 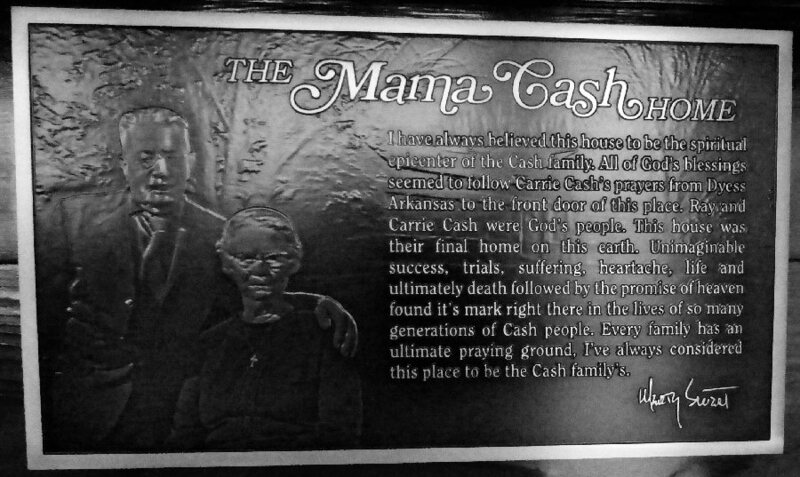 A plaque seen in the entrance way documenting the spiritual epicenter of the Cash Family. Brian and Sally have immersed themselves in the story of Johnny Cash. They are dedicated to preserving his memory by maintaining and restoring the homes in Tennessee that meant so much to Johnny and June Cash. 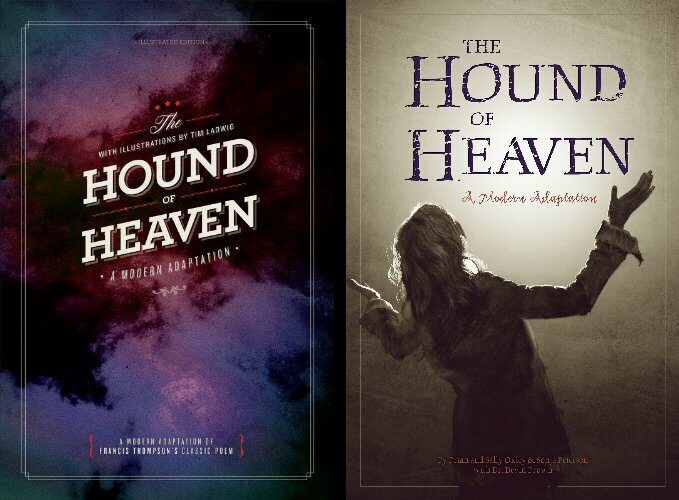 In addition they continue to promote their books especially The Hound Of Heaven adaptations to reach modern audiences who are also facing spiritual struggles just as Francis did back in the late 1800’s. The Hound Of Heaven – A Modern Adaptation takes the original poem from Francis Thompson and translates his poetry into words that a contemporary audience can comprehend. The book is beautifully illustrated on quality paper. It summarizes Francis life and his powerful poem. In many ways the pictures alone tells the struggle of the soul. This is a story that is timeless, very relatable to the life trajectory of Johnny Cash and is much needed in contemporary times.